Dr. Nguyen Thi Xuan Huong is a Phaco and LASIK Surgeon at Cao Thang Eye hospital (CTEH). Previously, she worked at Gia Dinh Hospital where she initiated “rhinostomy with an endoscopy and a silicon tube”, a new method for the hospital. She also performed “The essential blepharospasm (BEB) treatment by Botulinum toxin A”. While at Gia Dinh hospital, she received the Merit Certificate for being a distinctive young doctor from 2010-2012, and a 3rd place award at the First Phaco film gala held by Alcon. Prior to joining CTEH in June 2015, Dr. Huong worked at Binh Duong Columbia Asia hospital. 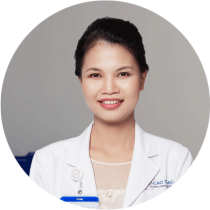 Dr. Huong graduated from the Pham Ngoc Thach University of Medicine with a General Doctor degree in 2004. She completed the specialist Level I program (equivalent to Master of Ophthalmology) at the Ho Chi Minh City University of Medicine and Pharmacy in 2008. Upon graduation Dr. Huong continued refining her skills by completing a number of certificates and courses. From the HCMC Eye Hospital she earned a certificate in the use of ultrasound in ophthalmology, and a certificate for basic Phaco. She also received a certificate in the use of Botulinum Toxin A (Dysport) at Pham Ngoc Thach University of Medicine, and a Laser treatment on anterior segment certificate from Cho Ray Hospital, a certificate of the art and skill of effective public speaking. In 2016, Dr. Huong obtained a certificate of visual training for refractive errors for ophthalmologists, HCMC Eye Hospital. Dr. Huong is a member of the HCMC Ophthalmological Society. • Co-Lead author of the paper “The efficiency of Limbal conjunctival auto-grafting in pterygium recurrent surgery”, (2010-2012).